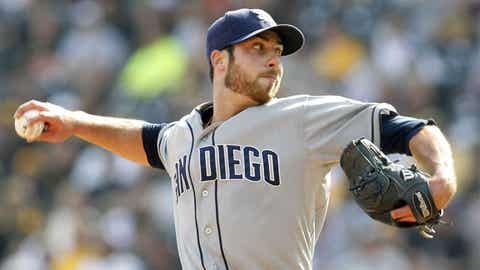 SAN DIEGO – The San Diego Padres today announced that they have acquired a player to be named later or cash considerations from the Houston Astros in exchange for right-handed pitcher Anthony Bass and a player to be named later or cash considerations. Executive Vice President/General Manager Josh Byrnes made the announcement. Bass, 26, posted a 5.36 ERA (25 ER, 42.0 IP) with 31 strikeouts against 20 walks over 24 relief appearances for the Padres this past season. The right-hander also made 15 starts for Triple-A Tucson in 2013, going 4-6 with a 5.45 ERA (48 ER, 79.1 IP) and 60 strikeouts against 17 walks. Originally signed by the Padres as a fifth-round selection in the 2008 First-Year Player Draft, Bass has gone 4-8 with one save, a 4.08 ERA (85 ER, 187.1 IP) and 135 strikeouts against 80 walks in 75 games, 18 starts, over parts of three Major League seasons with the Padres (2011-13). With today’s transaction the Padres currently have 39 players on the 40-man roster.